There are plenty of reasons to love Spain and they go well beyond our fondness for fiestas, siestas, and paella – although they will always hold a special place in our hearts. From the French influenced Basque region in the North, right down to the rambling and rustic villages of Andalusia in the South, it is a super diverse country both culturally and geographically. It offers everything from lush mountains to cultural cities with plenty of gastronomical and aesthetic delights sandwiched in between. We could think of 150 reason why we love Spain, but that’ll eat into our tapas time so here are 15 Spanish things that will make you want to book your flight tickets to explore Spain! Ok, so we all know that Joey might not share food but you will be doing yourself a huge disservice in Spain if you don’t embrace the food sharing culture. Tapas, small savoury dishes, are served in most bars and restaurants across the region. The term tapas pretty much covers all types of food as long as the portion is small. However, if you really want to eat like a local we suggest ordering some typically Spanish dishes: patatas bravas (potatoes smothered in aioli and a spicy tomato sauce), pulpo (octopus) some gambos pil pil (sizzling prawns in garlic, chilli and oil) and a couple of portions of pisto with cracked eggs (a stew of aubergine, peppers and courgettes). If your go-to on the wine list is the “cheapest red wine that you have” then you’re in for a treat in Spain. As one of the largest producers of wine in the world, there’s no such thing as a bad wine. Great wine is accessible to everyone and for as little as two euros a glass you can be enjoying some of the finest tinto in town. Pro tip: drink like a local. Enjoy wine from the region you are staying in and immerse yourself in some of their vino traditions. Staying in the North? Sample some aromatic Riojas or indulge in a full-bodied Tempranillo. If you find yourself in Barcelona, why not try drinking from the porró – a jug where you pour wine from a spout into your mouth. It’s a tricky one to master! If you’re venturing down South, why not try some of their regional varieties like a savoury Syrah, a peppery Cabernet Sauvignon or a fruity Merlot. If you’re not a fan of red wine, there are plenty of alternatives on offers. Cava, the sparkling wine of Spain, can be enjoyed with a late breakfast or as an early afternoon aperitif. Or perhaps a sherry from Andalusia is the one that will tick the box? As the region that produces almost all of the sherry that is shipped to the rest of the world, you can be sure you’re drinking some of the finest that they have to offer. Grandma would be so proud! Pintxos and tapas are often confused, but they are deliciously different. Pintxos, served in the Basque area, get their name from the Spanish verb ‘pinchar’, which means ‘to pierce’. While tapas are usually just a smaller version of a larger meal, pintxos are small snacks served on a stick and can be eaten standing up in one of the many packed pintxos bars in the Basque region. Tapas are pretty much available anywhere in the world, but pintxos have remained local to the area. If you find yourself in San Sebastian, we highly recommend joining one of the famous pintxos tours, where you will enjoy a culinary and cultural journey through the winding streets of the parte vieja (old town). Don’t despair if wine, cava or sherry doesn’t tickle your taste buds. The hills of the Basque and Asturias regions are peppered with small cideries, each serving up a variation of the sour, dry and slightly acidic cider that makes up the characteristics of Spanish sidra. You can’t swing a leg of ham in Spain without hitting another leg of ham. Hanging from the ceiling, piled high on countertops – it’s delicious and it’s everywhere. Who knew that dry cured meat could taste so good? Do yourself a favour, pick a spot in the old town (every part of Spain has an old town), order a glass of vino tinto, indulge in some jamon y queso and relax in a gluttonous glow. Nestled away in the province of Castello, Benicàssim is both the location and namesake of one of Europe’s biggest and best music festivals. Attracting thousands of music lovers from all over the world, the annual festival is the perfect blend of summer holiday and music festival. Music starts late in the afternoon allowing sun worshippers enough time to make the most of the golden rays and clear waters, before dancing late into the evening and doing it all over again the next day. Muy bueno! The Encierro, more commonly known as The Running of the Bulls, takes centre stage during the annual fiestas of San Fermin. Originally born from a need to move the bulls from outside the city into the centre of the bullring, the event now attracts people from all over the world who participate for fun. From mid-July you can partake in the unique event where once the clock strikes 8:00am, two rockets are launched, and the bulls are unleashed, galloping behind thousands of runners for a distance of 825 metres. Guaranteed to be the most terrifying and exhilarating five minutes of your life. What’s not to like about a tomato throwing festival? Getting smushed in the face with ripe fruit? Excellent. Unleashing all that pent-up aggression you hold for people who don’t wait until you get off the tube before they push on? Wonderful. Participating in the world largest food fight with 40,000 other tomato throwers? Brilliant! The best bit? Once it’s all over, the fire brigade hose down the streets and participants to ensure everyone is squeaky clean and ready to party on. 9. Get a kick out of the beautiful game! It wouldn’t be a post about Spain if we didn’t include a mention of the old futball. Here, football is like religion and some players are treated like Gods. Teams like Real Madrid, Barca or Atletico Madrid are considered some of the best in the world and if you find yourself here during football season, try and nab a ticket to one of their home games. Soak up the electric atmosphere, witness a little Titi-taka first hand and be sure to let out a fervent roar when your team scores. You might think that Carnival is only native to South America, but down in Cadiz they take Carnival to a whole new level. Every year in February the city turns into a melting pot of glitter, glamour, music and fun. Fireworks, dancers, floats and open air parties ensure the 10 day festival is nonstop from dawn until dusk. Over a number of centuries, Spanish architecture has had many influences. There is a great mix of Roman and Medieval hamlets, as well as cities like Seville, which blend Spanish and Moorish design. The jewel in the crown for many is Gaudi’s Sagrada Familia in Barcelona. A good rule of thumb for admiring Spanish architecture? Don’t forget to look up. There’s a lot happening on the roofs of churches and cathedrals that you’ll miss if you keep your gaze at street level. 12. Lights, camera, action, bravo! Spanish cinema is one of the most eclectic in the world covering everything from art-house film noir to Hollywood blockbusters. Award winning filmmakers such as Pedro Almodóvar, Isabel Coixet and Alejandro Amenábar have put Spanish cinematography firmly on the map through regularly casting Spanish actors such as Javier Bardem and Penelope Cruz in their productions. The San Sebastián International Film Festival, held in September each year, attracts the biggest and best of international cinema. Elizabeth Taylor, Antonio Banderas, Meryl Streep, Alfred Hitchock and Brad Pitt have all previously attended the glamourous affair. 13. Spain comes alive at night! The Spanish nightlife belongs to everyone. In any part of Spain you will see families sitting around large tables enjoying meals with their children well into the evening. Young people gather around the squares and outdoor bars enjoying drinks and dancing the night away, while the older generation relax on benches and set the world to rights. Spain is synonymous with multigenerational socialising and it is the perfect destination with a multitude of options for people of all ages. It can be super easy to get side tracked by the delicious food, charming architecture and seemingly bottomless booze that Espana has to offer. If you can peel yourself away from the jamon and rioja, there is plenty more waiting to be explored on foot. One of the most famous hikes Spain has to offer is The Camino de Santiago. Originally a pilgrimage ending at the shrine of the apostle St. James, in Santiago de Compostela, it now attracts thousands of recreational walkers every year. Some still embark on the trek for religious purposes, while other hikers have been known to embark on a spiritual journey of a different kind in order to find themselves and gain a new perspective. Others simply do it for the stunning views, sense of accomplishment, or simply just to get away from it all. If you like your hike with a little more bite, look no further than Sierra de Aitana trek located along the Costa Blanca. This mountainous hiking path is not for the faint hearted. Complete with rugged, uncut paths and jagged ridges, it is a labour of love but the soaring panoramic views, pristine scenery and almond blossom scented winds make it all worthwhile if you’re after something a little off the beaten track. Whether it’s catching some big waves at Munduka in Northern Spain or testing your water wings on the more sheltered beaches like La Concha in San Sebastian, there are surfing conditions to suit every level of surfer. With over 4,000km of coastline, new spots are added all the time and the surf season runs from autumn through to spring each year attracting surf enthusiasts from all corners of the globe. Ready to start your Spanish adventure? 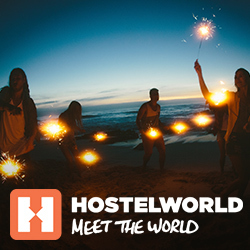 Book your hostels here!